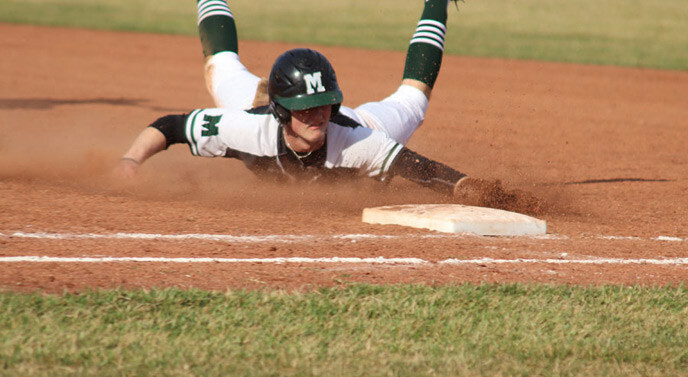 The Wildcats bats were hot last Thursday as Mulvane hosted the Clearwater Indians in an AVCTL D4 double header. Coach Nelson's Cats racked up 11 hits and 9 runs in game one as they beat the Indians 9-2. Juniors Gage Gerlach and Cole Diffenbaugh both recorded 2 hits and several other Wildcats (Benson, Nelson, Seier, M. Ellis, Dye, Klein, and Schmidt) recorded 1 hit each. Tanner Nelson and Mason Ellis both knocked in 2 RBIs each. Gerlach, Diffenbaugh, and Schmidt also recorded 1 RBI each. Senior speedster Drew Ellis stole 3 bases while pinch running. Junior Hunter Dye got the win on the mound and he recorded a complete game. Dye allowed only 3 hits and 1 earned run and he recorded 10 strikeouts. Game 2 was much of the same as the Cats tallied up 12 hits and 12 runs and got the win 12-9. Senior Nathan Klein led the Cats with 3 hits and 2 RBIs. Diffenbaugh, Gerlach, and Schmidt each recorded 2 hits and 5 RBIs between the trio. Freshman Hunter Seier and Junior Hunter Dye both recorded 1 hit and 1 RBI. Drew Ellis also recorded 3 more stolen bases in game 2. On the mound, Klein got the win with 2 innings pitched, gave up 3 hits, 0 earned runs, and 2 strikeouts. Schmidt put in 3 innings of work with 4 hits, 1 earned run, and 2 strikeouts. Seier pitched 2 innings with 4 hits, 3 earned runs, and 3 strikeouts. The Cats opened the season the previous Monday hosting the Circle Thunderbirds. The cats had some trouble getting the bats going and Coach Nelson pitched 7 pitchers in the double header to try to gauge the bullpen for the rest of the season. The Wildcats lost the first game 1-9 and the second game 1-17.